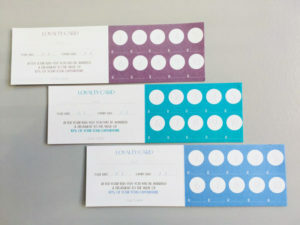 Our loyalty programme now affords you the opportunity to receive a stamp on a loyalty card every time you enjoy a treatment procedure by one of the therapists at our clinic! Once you have accumulated 10 stamps, you will be awarded a treatment to the value of 10% of your total expenditure. Please read our Terms and Conditions in this regard. Apply for your loyalty card today. The loyalty cards may only be utilised for treatments and procedures performed by our therapists at the Cosmetic Dermatology Centre (CDC) clinic in Century City. The loyalty cards may not be utilised for procedures performed by any of the Dermatologists. After your 10th visit, you will be awarded with a treatment to the value of 10% of your total expenditure. The complimentary treatment may only be a treatment performed by one of our therapists at CDC’s clinic and not redeemed for any other procedures performed by any of the Dermatologists. The complimentary treatment may not be used towards the purchase of any products or gift cards. The loyalty card is valid for 2 years only from the date stated on the card. Thus the date of the last treatment should be within the vicinity of 2 years. No exceptions in this regard will be allowed. The complimentary treatment must be redeemed within 6 months after your previous loyalty award.